Hello, all! Hope you had a great weekend! How about some Papertrey Ink goodness... Today's card is another Paper Crafts magazine reject. I submitted it to the latest Stamp It! Techniques call, masking category. Anyways, I started by rounding the top corners of the card base. Then, stamped the tree trunk from Falling Leaves in Dark Chocolate. Punched a circle from a large Post It Note and used it to mask off the top of the tree. Stamped the polka dots, from Polka Dot Basics II, in Spring Rain and then removed the mask. 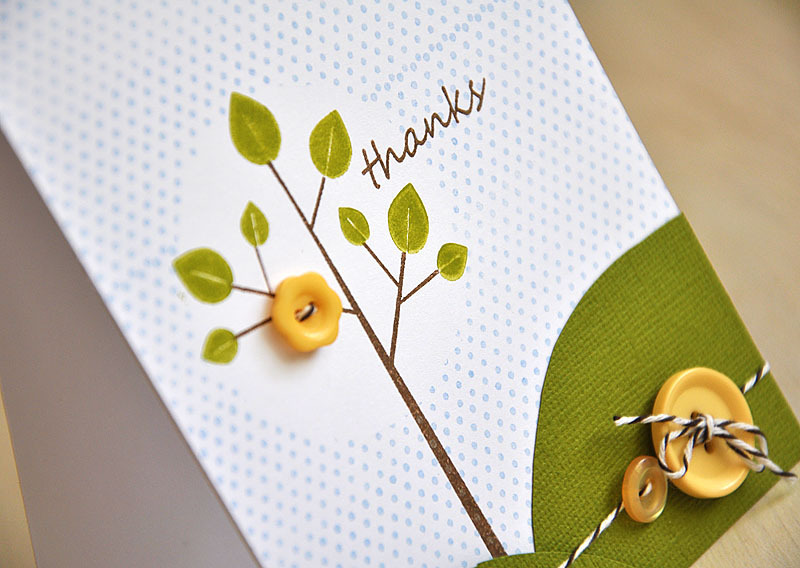 Stamped the leaves in Simply Chartreuse and embellished with a Harvest Gold flower button. 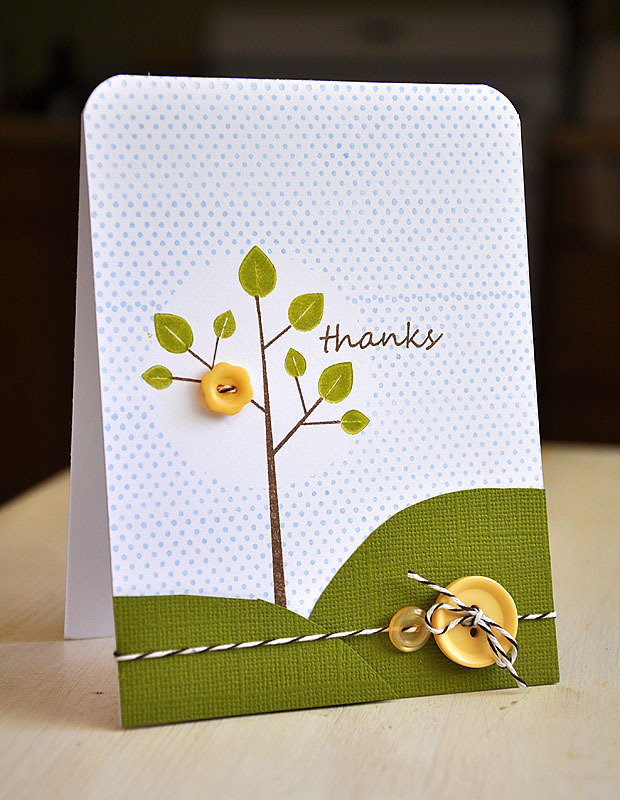 Finished the card off with a sentiment, hand cut hills, chocolate baker's twine and a couple more buttons. Here's A Tip: To give your hand cut hills a little more pop, attach the larger hill directly to the card base and use dimensional adhesive to attach the smaller hill slightly over lapping the larger hill. That's it from me today, have a great day! Love the simple style, button placement, colour - everything! Shame it wasn't chosen. LOVE what you've done with this card, Maile! Your color picks are divine! Such a pretty, happy little card Maile, love it! Such a cuuuuuuuuuuuuuuuute card!!!!!!!! Awesome!!! I like the blue dots!!! What a truly sweet card, Maile! Love your masking! I submitted to that category too, but I masked with stamps - never thought of this kinda masking! It looks fab! Such a cute card! I love your style. Love this card Maile!!! So perfect! Fantastic! Your details are always so amazing and just right! Well done. Oh this is too cute! I just love the design. I can't wait to see what they DID take! What a terrific idea (both the circle masking and popped up hill)! Thanks for sharing! This is a wonderful card! Shame it wasn't chosen. so sweet! love the fruit on the tree! such perfect touch! fab card! This card is fabulous! It is Papercrafts (readers) loss! This is lovely! I would have published it! Love the masked blue polka-dot background as the sky. It really highlights the tree. I canNOT believe this was not chosen! I love the card, & will be casing! ooh, so excited to see this card but it has been removed for publication! congrats ... will you be putting it back up?